There's definitely a connection between dog behavior and human pregnancy. So if you're pregnant and you've noticed some odd personality changes in your pet, and maybe even some undesirable behaviors, you're not alone. Human pregnancies really seem to affect some dogs. Find out why this happens and if will life ever return to normal. According to Jennifer Shryock, Certified Dog Behavior Consultant, dogs can sense all the subtle, and not so subtle, changes a woman's body goes through during pregnancy. Pregnancy triggers definite changes in a woman's hormone levels. Believe it or not, your dog can actually smell the difference in your body chemistry after you become pregnant. It has even been reported anecdotally that dogs can tell you're pregnant before you're aware of it yourself. The changes in your body's scent change can affect him in different ways. Your dog may seem confused by the scent change and act a little reluctant to be too close to you. Your dog may respond to your new scent by acting more affectionate and protective toward you. Your dog may actually remain happily oblivious to the entire change going on and continue to behave normally. Unless you were full-figured before the pregnancy, your body is going to increase noticeably in size. While some pets don't seem to register any notice of a growing belly, other dogs, especially smaller ones, may actually appear a little apprehensive about your new shape and changes in the way you move as the pregnancy progresses. Your pet may also become flustered the first time he's snuggled up with you and feels the baby move. If this happens, offer calm, loving reassurance that everything is all right. Your dog will also notice changes in your mood, such as when you're more tired than usual or stressed. They will also pick up on differences in body language, and if you begin to walk and move around differently as you gain pregnancy weight and get closer to your due date, your dog will notice. Can your dog sense if a stranger is pregnant? Considering the strength of their senses relative to ours and their reactions to familiar women becoming pregnant, it's definitely possible that they can sense pregnancy in a stranger. It's not yet conclusive though. A dog is able to determine their owner is pregnant because they are picking up on changes to the norm whereas a stranger they have just met has no baseline for them to judge against. The confusion some pets feel sometimes results in a dog acting up during pregnancy. Some dogs chew up items intended for the new baby. Some pets begin urinating in inappropriate places. Some dogs become moody and may growl or become uncooperative. Some dogs may become highly protective of the mom-to-be and growl and keep other people away from her. At the other end of the spectrum, your dog may not appear to be jealous at all. In fact, many dogs take their cues from their owners and readily welcome the baby into the home. In cases like this, the main concern may actually be protecting the baby from your dog's overly enthusiastic affections. Is it Safe to be Pregnant and Have a Dog? Due to all the behavior changes you may see in your dog, some expecting mothers become worried that having a dog around is not safe. For most dogs, it's just a matter of helping them to adjust to the changes with behavioral modification and environmental enrichment. If you are truly concerned about dog aggression towards a pregnant owner, contact a qualified behavior professional or veterinary behaviorist to assess the situation. Another concern is the health risks of which there are no current known dangers associated with dogs. Some concern may arise over dog poop being handled by a pregnant woman which comes from the known risk of toxoplasmosis from cat feces. This issue is restricted to cats and not dogs though. 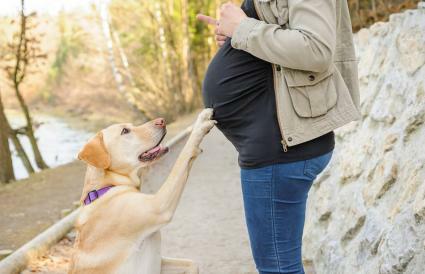 There's no way to predict how your dog will react to your pregnancy. However, there are some ways you can help your pet adjust to the changes to come. If you haven't already put your pet through obedience training, there's no time like the present. You can do this yourself if you're in the beginning stages of pregnancy, or you may want to ask your partner to attend training classes with your dog instead. If your dog has already been trained, it's a good time to start putting him through his paces to respond to the various commands. The extra structure may help him feel more secure knowing you're still in charge. Inappropriate urination has to be dealt with immediately before it gets totally out of hand. Clean up the soiled areas using an enzymatic cleaner that is designed to remove all traces of urine. Reinforce training by taking your pet outside and rewarding him for urinating in an appropriate place. If necessary, restrict your dog's run of the house to limit the areas where he soils until he's reliable again. Gradually vary your pet's feeding time so he's more flexible when the baby's schedule takes precedence. Exercise your dog at odd times, in addition to his regular schedule, so changes won't upset him too much. Consider installing a dog door so your pet isn't completely dependent on you when he needs to go outside. Dogs operate more by smell than by sight. You can help your pet prepare for baby's arrival by accustoming him to the scents of baby products. Bathe your pet in baby shampoo so the baby smells familiar to him. Rub baby powder in his coat for a dry shampoo between regular baths. Wash your pet's bedding using the baby's laundry detergent. One of the most important things you can do for your dog is get him used to the presence of someone else in your lap. Try holding a baby doll in your lap during your dog's usual snuggle time with you. This will begin to move your pet into his new position with the pack, yet reassure him that he can still be close to you as long as he behaves calmly around the baby. Take this opportunity to train him to behave the way you need him to without any risk to a real child. As the pregnancy progresses, the most important thing you can do for your pet is remain aware of how the changes in your life may affect him. Try to remain firm but patient and reassuring with him as you both adjust to your new lifestyle. Once the baby arrives and you all settle into your new routines, life will get back to normal.